Abe: Japan 'Cannot Accept' New Tariffs On U.S. Auto Imports : The Two-Way In remarks to the legislature, the prime minister said the possibility that the U.S. would raise the duty on auto imports from his country as high as 25 percent is "hard for Japan to understand." President Trump talks with Japanese Prime Minister Shinzo Abe before dinner at Trump's private Mar-a-Lago club, in April in Palm Beach, Fla.
"It's hard for Japan to understand and we cannot accept it," Abe said in a session of the Diet, Japan's parliament, adding that Tokyo would let Washington know its concern over the direction of U.S. trade policy. "The United States is the biggest market for Japanese carmakers and they have increasingly been shifting production to the country. If Trump decides to rein in auto imports, the production shift could accelerate and hollow out the domestic industry, which has contributed significantly to Japan's employment and growth. Toyota Motor Corp. has expressed its opposition to the U.S. move, stressing the Japanese group has contributed to the U.S. economy via its dealers and the employment it offers at its plants in the United States." The prime minister said any such trade adjustments needed to be pursued in accordance with the World Trade Organization. Abe's remarks came on the same day that the White House confirmed that Trump and Abe would meet in Washington on June 7 ahead of a planned summit between the president and North Korean Kim Jong Un in Singapore the following week. Abe is expected to attend the Group of Seven summit in Canada on June 8-9. 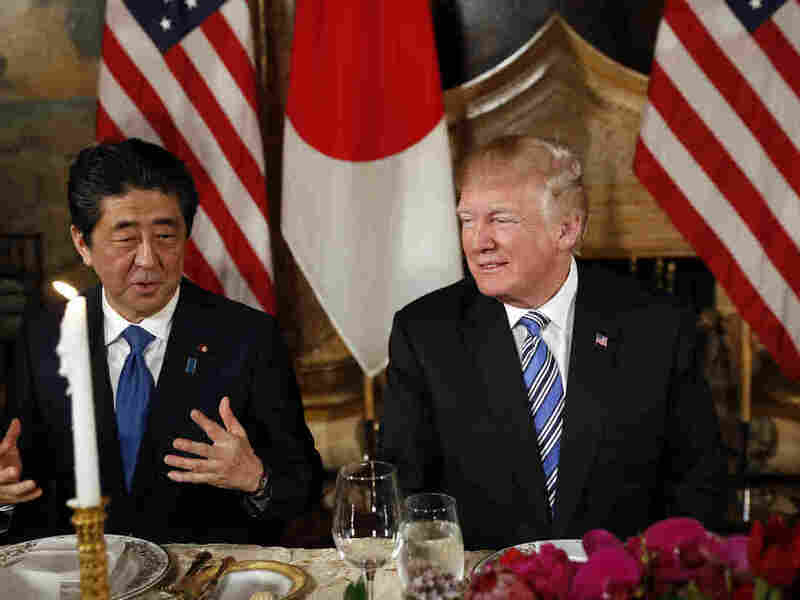 The Japan Times reports that in a Monday phone call between Trump and Abe, the two leaders "affirmed that they would meet ahead of the planned summit and discussed their shared goal of 'complete and permanent dismantlement of North Korea's nuclear, chemical, and biological weapons and ballistic missile programs,'" the White House said in a statement. Abe has banked on the reportedly close relationship he has managed to forge with Trump to smooth over any differences between Tokyo and Washington and hopefully head off the sort of full-blown trade war that seems possible between the U.S. and China. In his first stop in Asia in November, Trump spent three days in Japan, where he and Abe had a series of relaxed meetings. At the time, Trump said the U.S. and Japan were trying to "sort out" their trade differences. In April, ahead of a rare Koreas summit, Abe visited Washington. As NPR's Elise Hu wrote, Abe is facing political troubles at home, with many Japanese angry over cronyism scandals involving sweetheart deals and evidence that top Japanese officials doctored documents to cover it up. The possibility of crippling U.S. tariffs on such a key Japanese industry as auto-manufacturing can only make things more difficult for Abe.